Home / $CNY / $TLT / $USD / Oil / Petro-Yuan? Really? The launch of futures on Bitcoins was rushed so quickly through the regulatory channels that the anticipation was short-lived. And as the recent price action amply demonstrates, the existence of a derivative market has not tamed the digital token's volatility. It is still the early days, but Bitcoin futures do not look likely to change the world. On the other hand, any day now China is expected to launch a futures contract that even otherwise sober economists are gushing over for the world-changing potential. China has been testing an oil futures contract that would be denominated in yuan and backed by gold. The mere existence of the contract, we are warned, will dethrone the US dollar. We are reminded of the 1975 OPEC agreement to accept only the dollar for its oil has slowly eroded at the hands of Venezuela and Iran. China is the world's largest importer of oil, in a world of excess supply, it is a buyers’ market. An oil contract priced in yuan that can be swapped for gold is a major blow for the dollar. Reports suggest that Saudi Arabia is considering yuan as payment for its oil. Some oil companies based in Russia, Iran, and Venezuela already accept yuan payments. An oil contract priced in yuan that can be swapped for gold is a major blow for the dollar. The link to petroleum trade is seen a major component of the dollar's status in the world economy. All but 300k-350k barrels of oil a day are thought to be traded for currencies other than the dollar, of the roughly 82 mln barrel a day market. Dethroning the dollar here will push it along its inexorable death spiral. Yet, Russia, Venezuela, and Iran cannot quit the dollar system: They were fired. US sanctions have limited the access to dollar financing, the lifeblood of trade finance, as well as the deepest pool of liquidity. The US has gone down the path of what Benn Steil and Robert Litan dubbed "financial statecraft" (2006 book) especially since 9/11. The sanctions appear to have a wider cooling effect even on companies that may not be directly sanctioned. An oil futures contract denominated in yuan, with an option to receive gold, is a way to circumvent the sanctions, while at the same time providing Chinese oil producers and consumers, a derivative contract that could help them manage risk. The sheer size of China and its endowments, and the stage of its industrialized process means that it would be an important player in the commodity markets. In terms of volume, China futures market for nickel, iron ore, and steel are among largest and most important in the world. It says nothing about the role of the yuan or dollar in the world economy. Three decades ago, the agreement between the US and OPEC may have indeed been important. It was an advantage for the US and US financial institutions over rivals. It is less significant now. Cross-border capital flows outstrip trade flows may an order of magnitude. Consider a week's turnover in the foreign exchange market is greater than global trade in a year. What stands behind the dollar is not oil. It is not that most commodities are still traded in dollars. It is not gold, for which the US has roughly four times more monetary gold than China. What stands behind the dollar is the deepest, most liquid and transparent debt market in the world. Countries have accumulated reserves. At the end of H1 17, they stood at $11.2 trillion, of which US dollar accounted for nearly 64%. Except for the period around the advent of the euro, the dollar's share of reserves has been fairly steady. The euro is the second largest reserve currency, accounting for a little less than 20% of global reserves. Before the euro, the German mark, French franc, Belgian Franc, and the ECU accounted for somewhat greater share of global reserves than the euro does today. According to the IMF, the yuan's share of global reserves was about 1% in the middle of 2017. 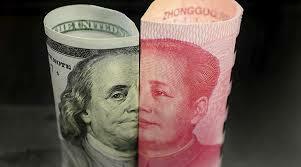 In the first six months after joining the SDR, the dollar value of yuan reserves increased by $8.6 bln to $99.4 bln. It barely kept pace with the growth in allocated reserves. The diversification of reserves on the margin have favored the Australian and Canadian dollars, which are not components of the SDR, but their share of global reserves is larger than the yuan. The diversification has come at the expense of Europe (including sterling) and the yen more than the US dollar. The accumulation of reserves often takes place as countries seek to prevent or slow their currency from appreciating. Some central banks accumulated reserves through rules that require hard currency to be converted by the central bank. As a Governor on the Federal Reserve Board, Bernanke suggested that this surplus savings (from Asia and OPEC) helped depress long-term US yields even as the Fed was raising the Fed funds target. This, in turn, may have contributed to the Great Financial Crisis. A few years ago, as the yuan was appreciating, its use in international payments increased. Many observers extrapolated and projected the trend higher to continue as China challenged the dollar. Alas, the yuan's share of cross-border payments, according to SWIFT, peaked in August 2015 at 2.79%. In October (November data due out on December 27), the yuan's share was 1.46%. Ironically, although many are concerned about the high levels of debt China has accumulated, the debt is not in the federal government hands. That means that its bond market, the one that could and may one day compete with US Treasuries, is far too small and under-developed. The value of the dollar reserves rose by more than $400 bln since the yuan entered the SDR. Could China's national bond market truly absorb such flows without disruptions? It also seems lost on the many observers that markets require much more than a contract to trade. They require transparency and a clear legal framework. China may be the factory of the world, but it has not convincingly produced these two social products. The yuan is not fully convertible, and intervention appears common. Capital controls are in place, and in any event, are subject to change. These features, among others, discourage foreign investors. Chinese officials may encourage state-owned companies to utilize the new futures contract. While the gold-backing may interest some, it creates its own complications. The futures contract will likely has a gold option embedded in it. The value of the futures contract then will be influenced by the price of gold, which makes it an imperfect hedge for oil producers and consumers. The daily correlation between the percent change in gold and the percent change in the Brent is about 0.03 over the past 60 sessions and have been as high as 0.31 this year (April). However, there was a period in February and mid-August through late September that the correlation was inverse. Paradoxically, that China is the world's largest importer of oil is seen somehow strengthening its hand to promote the international use of the yuan. Part of the reason China has replaced the US with this dubious honor of being the largest importer of oil is that the US has emerged as an energy powerhouse. It is shale and natural gas. It is refined products, including gasoline. It is exporting an increasing amount of energy products to Europe and Asia, competing in third markets with OPEC and other non-OPEC countries for the first time in a generation. The rise of the US as an energy producer is one of the most significant post-financial crisis economic and strategic developments, and yet the petro-yuan camp says nothing of this while misunderstanding what makes the dollar the numeraire. China may do what it can to ensure a successful contract launch, just as it did in 1993 to launch a oil futures contract. It lasted a couple of years. In the long-run, we suspect the gold-option complicates the offering, and in any event, the futures contract will not overcome the fundamental obstacles to the challenges of internationalizing the yuan. There is a rubber futures contract that trades in Tokyo in yen. It says nothing about rubber or the yen in the world economy. Rubber is a smaller market than oil, but the principle is the same. Many of the same people who jump from one possible alternative to the dollar to the next have jumped upon China's intention to launch an oil futures contract as the new new thing. It is not.